First opened in 1992, the course at Golf du Claux Amic was designed by Jean-Pascal Fourés and its one of a dozen golf projects the French architect has been involved in over the last couple of decades. Located within an oak forest that was formerly used as a hunting ground, fairways sit at an altitude of around 600 metres above sea level, close to the small town of Grasse, the world’s perfume capital. Narrow fairways dominate proceedings here and for those who veer from the designated playing corridors, there are literally tons of small rocks and stones strewn amongst the rough to hinder the search for stray golf balls. The course reopened in 2012 following the construction of a modern clubhouse, the installation of a new golf academy and the remodeling of several holes, including the par four 1st, par three 3rd and par five 18th. A new hotel and associated apartments are scheduled to open for business in early 2016. On arrival, golfers are bound to be struck by the sight of a wonderful new modern clubhouse and practice facility. When you then see the ongoing construction of an adjacent 50-bedroom hotel and 90-apartment accommodation block close to the 9th and 18th greens, then you know for sure that this particular golf complex is going places. A substantial financial investment has been made to upgrade the facilities and I’m sure that, in time, Claux Amic will become one of the top ranked layouts in the region. For now though, it’s a little rough around the edges on the playing front and I was a little surprised to find a number of tees verging on the scruffy side, with unraked bunkers - and deer hoof prints in the sand - accentuating the rather unkempt look. 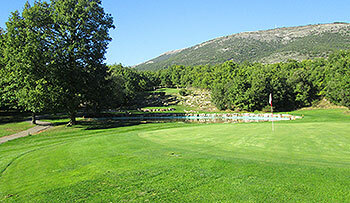 Presumably, as the International de la Riviera Grasse Pro-am was scheduled for play a couple of days later, these relatively minor conditioning matters would be attended to before the competition began. On the positive side, when the new putting surface on the 3rd has bedded in, this hole will become one of the most photogenic on the Riviera, featuring long panoramic views past the infinity green on the edge of the escarpment to the coast in the distance. Holes 4 and 5 at the highest point on the property are also terrific holes, bounded on the right side of either fairway by an imposing stone wall that separates the course from the next estate. I don’t normally like right angled dog legged holes but the short downhill par four 16th is one that actually works well, turning sharply left to a green that sits in front of a kidney-shaped irrigation pond. The new 18th is another hole that’s very pleasing on the eye, snaking gently downhill towards the home green. In fairness, Claux Amic’s still going through something of a gestation period but once it’s fully developed, it will be a golfing force to be reckoned with in the local area.